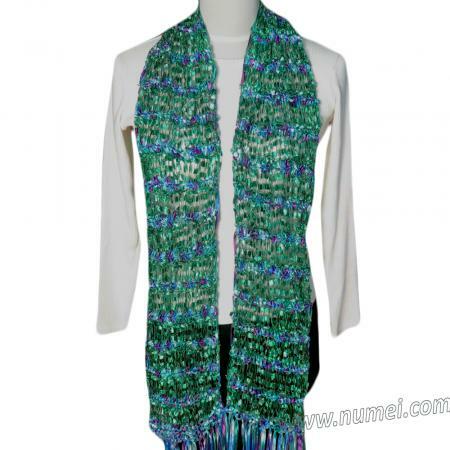 This is another exquisite scarf made with alternate rows of Memento ribbon yarn and East Track II ladder yarn. Be dazzled by the brilliant fusion of color and shimmer in this stunning scarf that twinkles and wows! Scarf pictured is made using East Track II Col 131 and Memento Col 129. With Memento, cast on 24 sts. Join East Track II (do not cut Memento yarn; carry up along side of work). R3: K1, *(YO twice, K1), rep * till end. Rep R3-6 till you are almost out of East Track II yarn. End with R1-4 with Memento yarn. Cut about 40 strands of Memento yarn about 12" long and attach 20 strands to each end of scarf.